Many resort golf courses can be typified-described without really looking at them. They'll have wide fairways, even wider rough areas (cut short), lots of water, lots of aesthetic beauty, fairly slow greens, and will provide a pleasant golf experience. They're designed to leave you with a good taste in your mouth when you leave the 18th green. They're just hard enough to allow you to remember a well played shot, and just easy enough to let you mark down some good scores. They're also not real taxing. When you're done with the round, you can go play tennis or hit the pool. Or the Spa. After all, you're on vacation. Playing some fun, but relatively easy golf is part of the experience. The Pete Dye designed PGA West Stadium course fits this 'easy resort course' description like a square peg does a round hole. Don't get me wrong-the experience you take from the course is still entirely positive-it' s just not quite such a tiptoe through the tulips to get there. Pete Dye (in the mid eighties) wanted to follow up his work on the first TPC course--at Sawgrass-- with a western version of the Tournament Players Championship layout. He also set out to make the most difficult track in the country. Well, he's done it. Pete Dye at PGA West uses more scale than lady justice with her blindfold and weights. He's taken the varied desert landscape and molded 18 #1 handicap holes-and it's difficult to go from one hole to the next without thinking that it possibly can't get any tougher. It often did. The course is so tough that it's even scared off the pros. 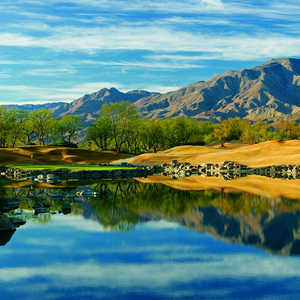 PGA West Stadium has hosted the Bob Hope Desert Classic, the Skins Game and other noteworthy events, only to be dropped in subsequent years because the pros were making too many bogeys--and complaining about it. Now it stands as a monument to what was-and can be again. Dye uses scale and visual intimidation as much as sand, water and deep rough to get inside your head and force you to beg for mercy. Block out what COULD go wrong while playing, and you'll probably be okay. Because there's something about each hole that can get to you. It's a course where you'll definitely have to play within yourself-if you manage it right, you' ll leave satisfied. I had the privilege of playing the course with PGA West's Director of Marketing, KC Kinsey. After the first two holes, I asked Kinsey, "When does it ease up?" He replied simply, "It doesn't." Kinsey did a fantastic job of pointing us in the right direction throughout the round to take some of the edge off the course-sometimes it worked, sometimes it didn't. But true to his prediction, it didn't get any easier. All this being said, the Stadium course doesn't beat you up. It'll push you to the extent of your endurance, but never once do you feel that you're licked. You just have to approach each hole as a separate challenge, and do your best to beat it before it beats you. Kinsey prepared us before the round for what's to come-"The course plays extremely long, partly due to yardage, and partly due to the nature of the ground. Even balls in the fairway often have an uneven lie because of all the undulation and mounding." "Because it plays so long, many people come away from the Stadium course either loving or hating it. The length and abundant hazards causes everyone to shoot higher than they would on their home course-at least for their first time out." I'd say, after my first trip to the Stadium--I'm a lot closer to the love side than the hate side. I love challenges, and would much rather play something too hard than too easy. PGA West Stadium fits the bill perfectly. It's rare that you get a layout where each hole is truly unique. PGA West Stadium is such a course-each hole could have a separate description-to go along with the different names on the holes. I'll highlight the most memorable. Number five is a par five, 535 yards from the back. 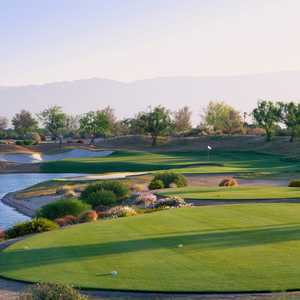 Players are greeted with the prospect of shooting over a lake that runs down the length of the landing area on the left side, and bunkers and rough to the right. Dye's use of the lake bordered by his signature railroad ties continues his placement of hazards for visual intimidation. It doesn't stop for the second shot-which introduces a second lake and more railroad ties, this time on the right side. How short you want your third shot determines how much lake you'd like to flirt with on your second. Number six probably takes the prize for most difficult hole, a 255 yard Par three that calls for a full water carry unless you bail out to the left. I noticed the drop area (which I needed to use) had more divots than the tee boxes. This hole alone probably keeps PGA West at the top of the 'recycled ball' resales category. Kinsey put it appropriately "anything to the right swims with the fishes." I'll bet the golf balls outnumber the fish easy. Nine is the #1 handicap hole on the hardest course in the country, so it's a good bet that it'll test you. 452 yards from the back, there's water and sand down the entire length on the right; if you don't cut off enough of the slight dogleg, your second shot is a lay-up. Deep rough, bunkers and water frame the green. You can run it up, but it'll be with a three-wood or long iron, most likely. Get a par on this hole and it feels like a birdie. Ten is a crafty medium length par four (416 yards) that calls for shooting over water on the tee ball as well as the second shot-a lake runs the entire length on the left and the hole is a slight dog leg left. This time, instead of railroad ties, Dye uses rocks to border the water. A beautiful hole. Sixteen is a slight dogleg left par five at 566 yards. If your tee ball is left, you're in an extremely deep bunker that will allow only a pitch to the fairway. Going for it in two isn't realistic, even with a booming tee shot. Lay-up to the right with the second and avoid flirting with the famous bunkers nearer the green on the left with the third. It's said that Tip O' Neil took 10 shots to get out of that same bunker in years past. I believe it. Seventeen is named 'Alcatraz' and the moniker suits it. It only plays to 168 yards from the tips, but the tee sits high up and the wind blows strong. The green is actually fairly large-but once again, the size of the lake surrounding the island green makes it look tiny. There's even a plaque here that commemorates Lee Trevino's hole in one during the 1987 Skins game. Hard to forget this hole. The round concludes with another 439-yard tester with water all down the left hand side. By now, you're used to it. One great hole after another-the finishing hole is no exception.